Innovate or Renovate? It's time to switch out those food obsessions and anxieties with some new food trends and options. Try revitalizing yourself and "detox." It's about cleansing; removing toxins from the body and allowing energy in. 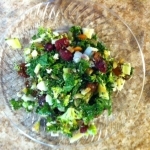 Former Triangle neighbor, Deb Chapman, sends this crunchy, satisfying salad to make as a perfect lunch, snack or side dish. Chop vegetables into 1/2 inch to 1 inch chunks or pulse in a food processor. Mix in a large bowl. Add parsley, sunflower seeds, almonds and dried fruit, stir. Add dressing ingredients and toss to coat. Season with salt and pepper to taste. Tip: Keeps for 5-6 days in refrigerator.